Zip it good: OK, so we’ve established that State College is one of the most walkable cities in America. But sometimes you just need a car. Onward State reports that, starting today, Zipcar car-sharing service is now available in State College, offering sweet rides —like a sporty Ford Focus, Toyota Prius, and more—for low hourly rates ($7.50/hour), and helping the car-less among us avoid grocery shopping trips that end like this. 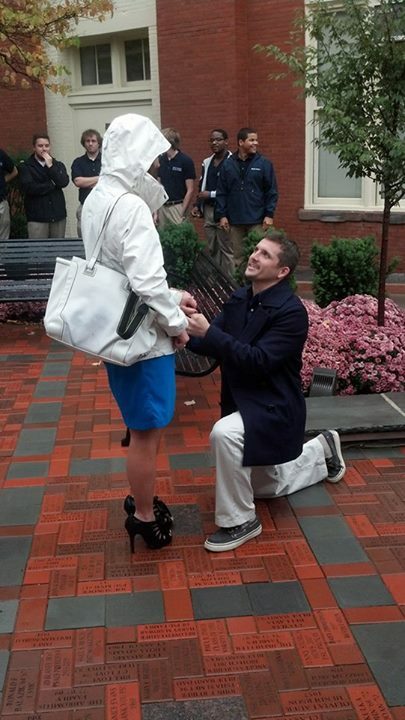 Laura Youngers ’11 says ʺyesʺ to Ryan Ward ’10. Via the Penn State Alumni Association Facebook page. Ring pops: I’m beginning to think there’s something in the air at Alumni Association events. Back in August, there was this elaborate proposal from the Syracuse pep rally in NYC (look for more on that in our Nov./Dec. issue), and last week, the Alumni Courtyard dedication ceremony inspired this rainy yet romantic moment just outside my office in Hintz. So, for those of you planning to pop the question, here’s the list of upcoming PSAA events. And don’t forget to invite me to the wedding. Cute x2: Not awwwing yet? Well, check out this quick GoPSUTV clip of Lady Lion Maggie Lucas’ adorable pups, Gypsy and Gus. Because we all can spare 20 seconds for puppies. Entry filed under: Alumni Association, State College. Tags: Donald C. Graham, Kyle Johnson, Laura Youngers, Miles Diffenbach, Penn State Alumni Courtyard, Ryan Ward, Zipcar.